Jennifer Stuckert, Olivia Aaron, Heidi Brigman et al. Trapped aboard the family yacht and drifting out in open water, Samantha, a young woman with a clouded past and dark secrets, is forced to live out her own disfiguring punishments night after night. Stuck outside and running out of time, Samantha's former love, Mark, tries to save her as the truth about her family's murder begins to unravel revealing the malicious force that seeks to claim them. Otherwise known as ‘Alarmed’, this story takes a long time to get going. In fact, for a while, it is difficult to imagine it developing into a horror film at all. Jennifer Stuckart plays lead Samantha neither as a screaming damsel in distress or as a traditionally sassy no-nonsense ‘final girl’. She is simply an intelligent woman caught up in a spiral of very odd events. The boat itself seems to be trying to get Samantha to confront the truth regarding the death of her family some years earlier. It does this by separating her from boyfriend Mark (Brian Rife) by locking him out of the cabin area with her on the inside. And there he stays (vast bulks of his dialogue consists of urgent pleas: ‘Sam, look at me, stay with me, Sam’ ad nauseum). 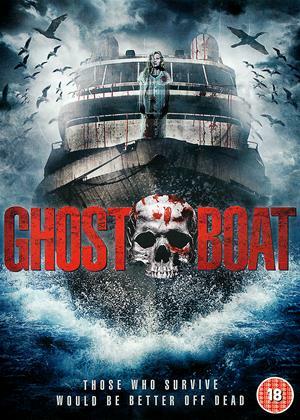 Nothing Sam does has any effect on the machinations of the ‘ghost boat’ (as a SPOILER, she is instructed to harm herself again and again, which she resists. When her allotted time runs out, the ‘boat’ forces her to do it anyway). After every episode, we appear to go back to beginning again. Unfortunately, things quickly become wearisome. Or to be more precise, things SLOWLY become tedious, because nothing happens with much urgency at all. Despite the admirably restrained playing of the cast, we appear to be waiting for something to happen and resisting the urge to go and do something else instead. Director (and writer) Matt Lofgren occasionally injects the dullness with feeling of tension (moments that are very reliant on the performances more than anything else) but it isn’t enough to lift events from tedium. The boat itself looks lovely, but there is no sense of remoteness and no dark corners conducive to a haunting, or whatever it is that’s happening here. The cast deserved better, sadly.